Originally named "Guanahani" by the Lucayan Indians, San Salvador Island is very unique in it's own right. The capital of this island is Cockburn Town, located on the west end of the island, the total combined population of this island is less than 1000 people. Surrounded by waters reaching a depth of up to 4000 meters, San Salvador's shape is that of a pod. East-West length of the island being 11.2 km and the north-south distance being 19.25km,with the total surface area measuring 94.9km squared. The population according to the 2000 census is approximately 950 residents. On top of a ridge, on the east side of Flamingo Pond, lies the highest point of elevation, reaching a height of 37.5 meters. Vegetation or "Scruch" on San Salvador consists of 524 species, or vascular plants in 265 genera, which represents around 96 separate families. The islands position, being away from the Bahamas Bank, makes San Salvador unique in itself. It's unique position also is the main influence behind such things as climate, culture as well as ecology. 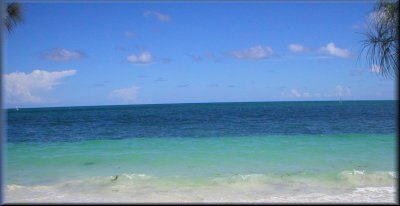 From the southern most extremity of Florida, San Salvador lies to the east, on an isolated carbonate platform well east of the Great Bahama Bank, 24 degrees north latitude and 75 degrees longitude. Statistically, the island will be hit by a tropical storm every 2.85 years. In 1999 on September 13,Hurricane Floyd passed approximately 20 miles to the north of the island, with winds reaching 155 mph. Hurricane Floyd was the last storm to hit the island, causing extreme damage while marking it's path. In the year of 1492, San Salvador became the first landfall site of the legendary Christopher Columbus, while undertaking his voyage of discovery. Four individual marks set around the island mark the four points at which it is noted he landed. At the point of Longbay, a huge stone cross stands marking one point of his journey. On an expedition to Florida in 1513, Ponce de Leon, the island was cleared of all existing population. Two theories excepted as to the relocation of the island's population at that time are that existing people were either victims of European diseases or they were deported to the Greater Antilles as slaves. Eventually the British would claim the island and declare it as a Crown possession in 1629. In 1783, forced away from the United States, American colonists loyal to Britain migrated to and inhabited the area. For labour purposes, African slaves were used until the Crown abolished the use of slaves in 1834. More recently, the first American engineers visited San Salvador. Their purpose was to build a runway for radar tracking control station personal already sent to the island. The tiny still, undeveloped island then only had a single road on which to access the entire island. It had been said that years before their arrival, the highest point on the island was where R.A.F. people were held during WW II. It has also been said that the housing provided for these people was once owned by M.R. Harry Oakes, who was murdered mysteriously. Many of the remaining structures left behind by the United States workers have been of great benefit to San Salvador. The built Runway still intact, the remaining buildings being used for such things as a college.